Gustave and Barbara apparently remained in Houston, Texas, where Gustave became a well known and important gun-smith and dealer. They had 8 children between 1842 and 1856 (see family tree, below), and were well-off; the census records show their assets grew from $12,000 in 1860 to 15,000 in 1870, and that they had servants. Barbara died in her 57th year, on 17 August, 1872, and Gustave in his 60th, on 5 January, 1874. 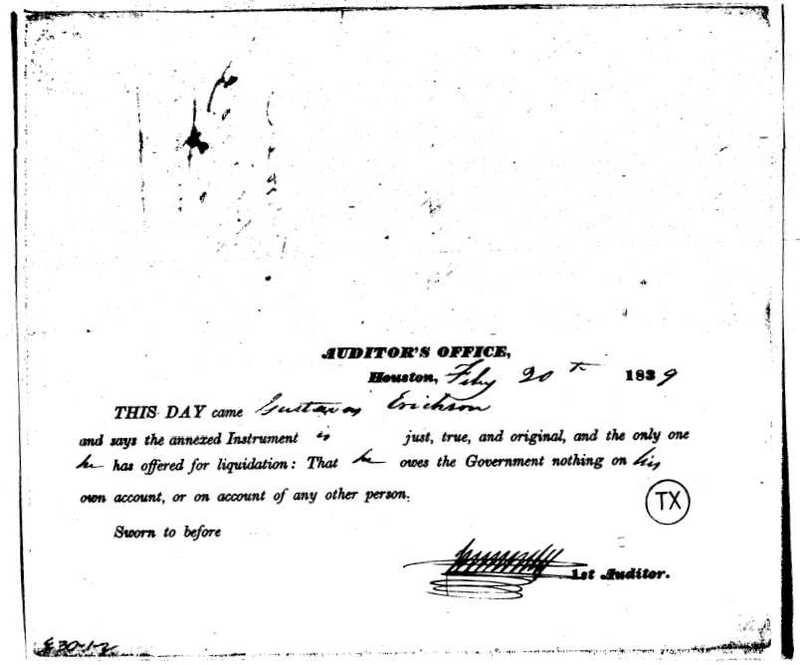 Earlier, during June, 1838, Gustave worked as a civilian for the Army of the Republic of Texas. He invoiced the republic $35 for Making the Iron work to an Emery machine. 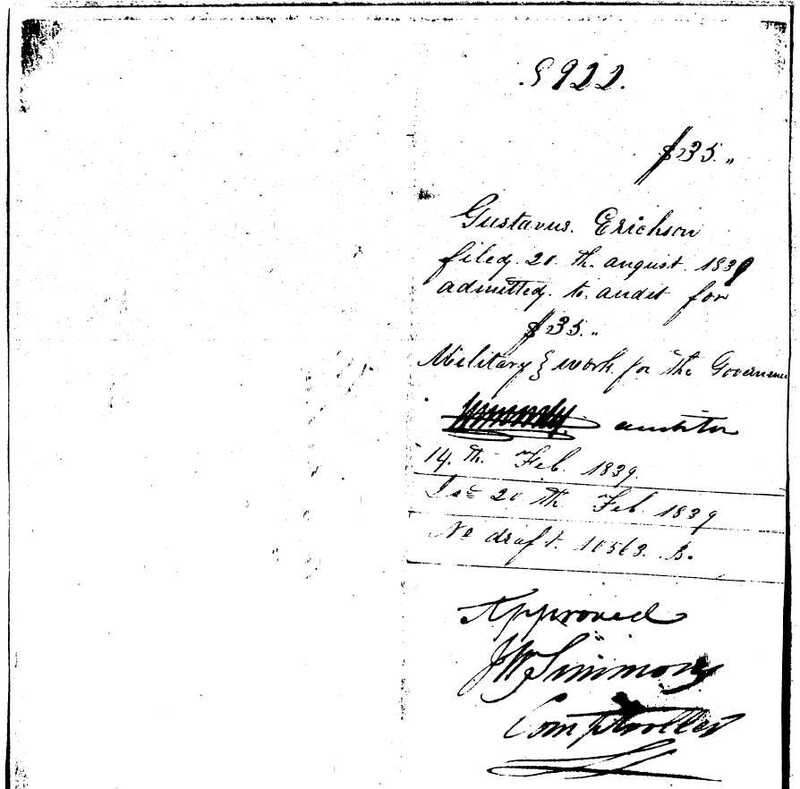 His audited claim (#8922) was authorized for payment on 14 February, 1839. In June & July, 1847, Gustave was the grantee for two plots of land in Bexar County, each 320 acres. It’s possible they were in payment for services rendered to the republic/state. Two of Gustave’s sons, Otto and Alexander, continued in the gun trade and owned gun-shops. During the US Civil War (1861-1865), Otto served as a private in the Confederate States Army (Company C, 1 Texas Heavy Artillery). Otto and Alexander (then a teenager) reportedly also worked at a pistol factory in Andersonville. The following excerpts were kindly provided by Chris Hirsch from his forthcoming book: “The Texas Gun Trade, 1780 - 1899” (work in progress, 2004, Houston, Texas). Chris specializes in the restoration of antique firearms. Belgium made double barrel cartridge shotgun with O. Erichson stamps. It was common for the larger gun dealers to have their names stamped on imported shotguns. Erichson, Otto 1860 - 1890s in Houston. Listed as a gun & locksmith. 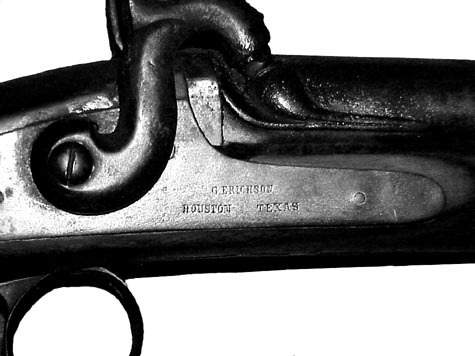 Was the son and successor to longtime Houston gunsmith, Gustave Erichson. Otto worked with Gustave approximately from 1866 through 1872. Listed as O. Erichson & Bro. In 1877 at Gustave’s address, as O. & A. Erichson in 1878, as the Houston Gun Works - Erichson Bros. in 1881 and O. Erichson & Co. in 1882. Otto was listed as Market Master at City Hall in 1886 and gunsmith again by 1889. (Houston Directory). He was possibly associated with L. T. Noyes in 1884 and Michael Floeck in 1888. Listed as Otto Erichson in 1890 at 275 Preston Street. 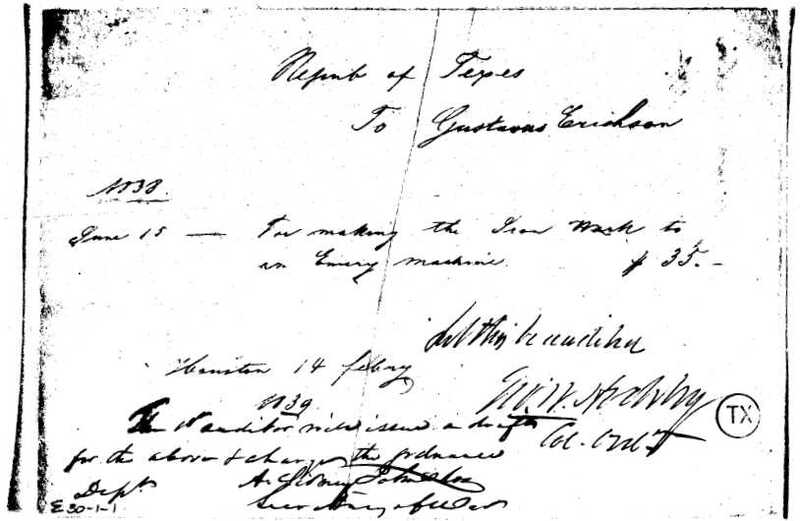 Listed as a gunsmith in the 1860 & 1870 census with father, Gustave. 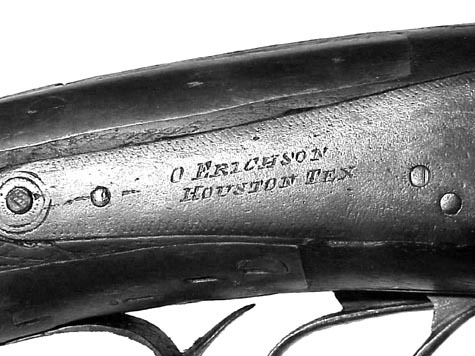 (Texas Directory) (1860 & 1870 census) Three imported, double barrel, cartridge shotguns are known, one with "O. Erichson – Houston Tex" engraved on the lockplates. The other has "O. Erichson & Co." on the lock and "O.Erichson & Co. Houston, Tex." stamped on the top rib of the barrels. b: 3 Jun. 1813, Prussia. In the 1860 US census, living with Gustave & Barbara was Julius Erichson, 32, born in Prussia, likely a younger brother or cousin of Gustave’s. He was a clerk with assets of $5,000 in real estate and $5,000 in personal assets. In 1870 he was living alone in a boarding house. He died 4 February, 1905, aged 76 (Houston Chronicle Obits. ).